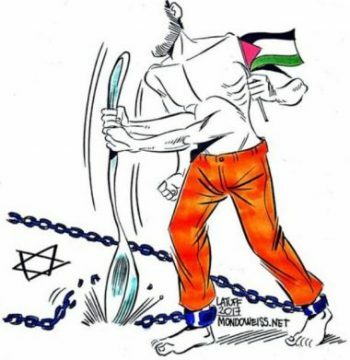 The “Detainees’ Media Office” has reported, Monday, that six Palestinian detainees, held by Israel under arbitrary Administrative Detention orders without charges or trial, are ongoing with hunger strike, rejecting their illegal detention. The detainees are demanding the Prison Authority to stop holding them under such orders, by either releasing them, or file charges against them, instead of repeatedly renewing the detention orders against them. The Detainees’ Media center said the striking detainees are Islam Jawareesh, Issa Awad, Mahmoud Ayyad, Omar Abu Shkheidim, Anas Shadeed and Hasan Shouka. It said that Hasan Shouka, from Bethlehem, started his strike 51 days earlier, protesting being held without charges since October 01, 2017, especially since the prison authority has renewed the Administrative Detention orders against them three consecutive times, an issue that forced him to declare an open-ended hunger strike. The detainee was repeatedly abducted and imprisoned by Israel, and spent nearly 13 years in prison as a result of these arrests. The Detainee’s Media Center stated that detainee Islam Jawareesh, 29, from ‘Aida refugee camp, Anas Mahmoud Ayyad, 33, from Deheishe refugee camp, in Bethlehem, and Issa Awad, 30, from Hebron, are also ongoing with the hunger strike, protesting their Administrative Detention orders. The three detainees declared hunger strike nearly three weeks ago, after each of them spent 18 months under Administrative Detention orders, while detainees Omar Diab Abu Shkheidim, 32, and Anas Ibrahim Shadeed, 22, from Hebron, started their strikes five days ago, protesting renewed Administrative Detention orders against them. Abu Shkheidim was taken prisoner on December 26, 2017, and received two consecutive administrative detention orders, each for six months, while Shadeed was abducted on June 14, 2017, and received three consecutive administrative detention orders, each for six months. It is worth mentioning that Shadeed previously went on hunger strike for more than 90 days, before Israel agreed not to renew his detention orders, but he was abducted, once again, after his release, and was received the same orders.